How to clearly explain the complex and messy four-way 1860 presidential campaign to a modern audience? The solution became one of the more daring and imaginative exhibits in the museum. It is a striking example of the use of 21st century technology and language to bring 19th century ideas to life. 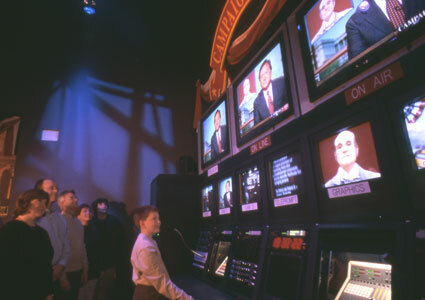 Visitors enter a contemporary television news control room where they see the video production of a 21st Century style news broadcast, hosted by the late NBC news legend, Tim Russert. On nine control room monitors, campaign ads using period settings and authentic campaign strategies are analyzed. There are commercials for each of the four candidates – Abraham Lincoln, Stephen Douglas, John Breckinridge, and John Bell – with their actual campaign platforms spun into the political terminology and sound-bites of today. Politicians were skilled and calculating even back then.